I want to tell you about my new project, Bit Lasso Reveal. For years, I’ve worked on slide decks. Hundreds and hundreds of slide decks–sales decks, strategy decks, roadmap decks, investor decks. I did a few presentations before founding Pancetera, but my real introduction to PowerPoint was building the pitch deck for that company. Building a presentation that would raise millions of dollars took an entire summer of monkeying with PowerPoint, and after a few weeks, I remember telling my cofounders I suddenly understood how to make decent decks. I didn’t, really, but I had gotten a lot better at it. I ended up with over 100 versions of that original pitch deck on my laptop. What is it about slides that causes so much version sprawl? Every time we present, we make changes–the audience was confused by a picture, something felt out of order, a key element was missing. But we never know for sure: did we make the deck better, or worse? Let me throw some of these slides in the back. Collaborating also leads to sprawl, with copies of decks floating in email, cloud drives, attached to tickets or Wikis, posted in Slack–it’s a huge mess. So switch to Office 365 or Google Slides and be done, right? Well, not really–these just move the problem around, but they don’t change how we work with slides. A bunch of slide covers. You can see in the screenshot I have lots of versions of a deck I was working on a few years ago. How can I quickly find the specific slide I want? I can’t! I have to open the decks up and look through them manually. But with Bit Lasso Reveal, I can immediately see all the “How It Works” slides I have for these decks. I don’t have to open the decks up, and the slides are automatically stacked into similar piles. You can see I have a number of variations of these slides, as I evolved the concept over months of thinking about it, and now I can see a complete history of those thoughts–perhaps at some point in the past, a concept was removed from a slide and I’d like to get it back–with Reveal, I can identify those changes over time. The best part: Reveal doesn’t require any changes to how you work. You can carry on in as tidy or as messy of a fashion as you’d like. Go ahead and put slides in email, on your desktop, in Dropbox, or OneDrive, or all of them–Reveal doesn’t care. 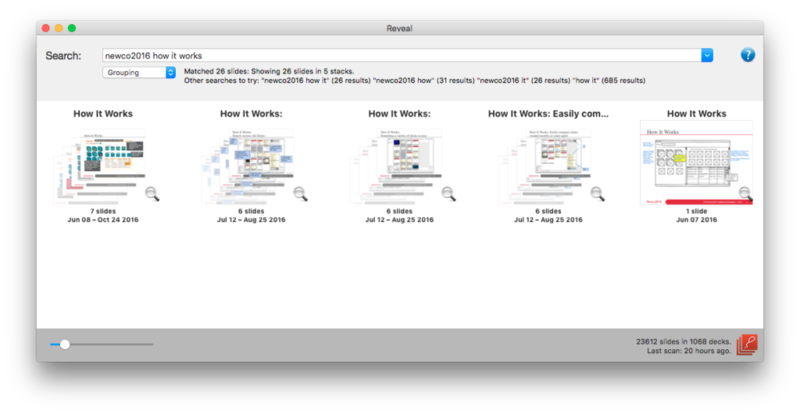 Reveal automatically finds your slides and organizes them in its own database without altering your content. 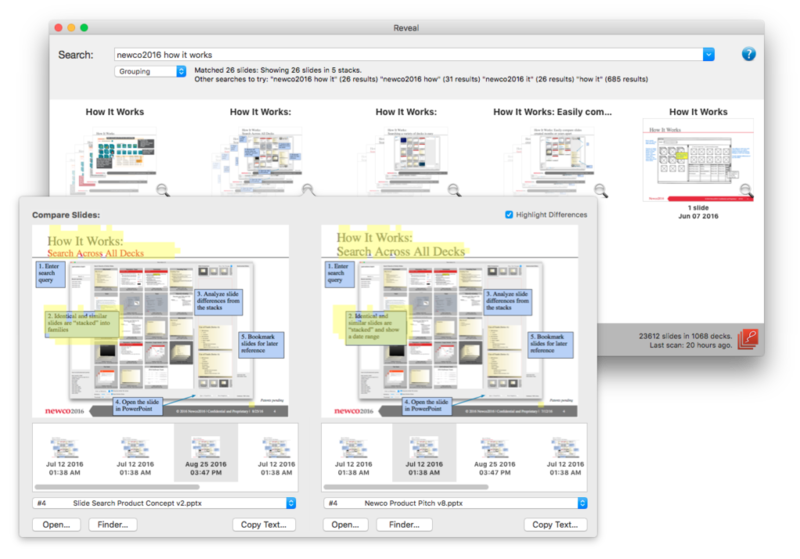 Reveal can even associate slides that you have in both Keynote and PowerPoint versions!